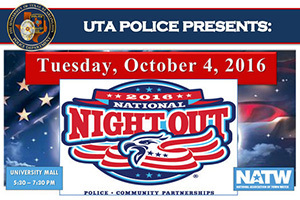 Join the UTA Police Department for National Night Out 5:30-7:30 p.m. today, Tuesday, Oct. 4, on the University Center mall. National Night Out is an annual community-building campaign that promotes partnerships and community camaraderie to make our campus a safer, better place to live, study, work, and play. This year’s event will have personal safety demonstrations, emergency vehicles on display, games, door prizes, and free food. A bystander initiative to recognize, choose, and act responsibly concerning hazing is part of National Hazing Prevention Week, which runs through Thursday, Oct. 6. 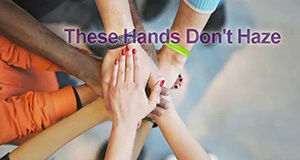 Sign a banner supporting the anti-hazing efforts 11 a.m.-1 p.m. through Thursday by the University Center art gallery. Go inside the gallery for an interactive exhibit. A Lunch and Learn includes a discussion on hazing incidents 12:30-1:30 p.m. Thursday in the Palo Duro Lounge. The free lunch is open to students, faculty, and staff. LEARN MORE. 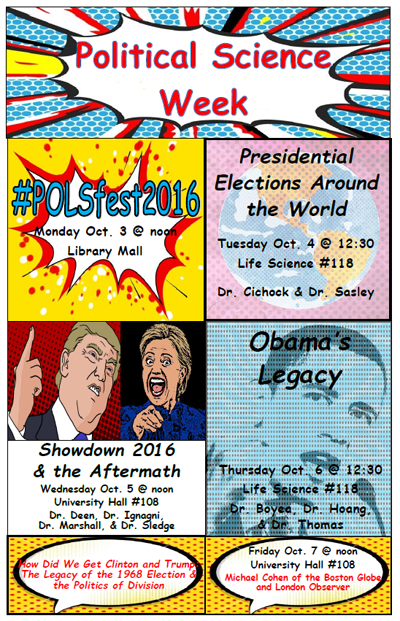 Explore the ins, outs, ups, and downs of politics during Political Science Week through Friday, Oct. 7. The Department of Political Science hosts panel discussions with faculty members on topics such as "Presidential Elections Around the World" on Tuesday, "Showdown 2016 and the Aftermath" on Wednesday, and "Obama's Legacy" on Thursday. The week wraps up Friday with a panel on "How Did We Get Clinton and Trump? The Legacy of the 1968 Election and the Politics of Division." LEARN MORE. 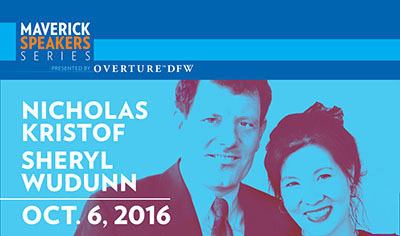 Tickets are still available to see journalists and humanitarians Nicholas Kristof and Sheryl WuDunn at the Maverick Speakers Series event. The Pulitzer Prize-winning husband-and-wife duo will speak on "A Path Appears: How an Individual Can Change the World" at 7:30 p.m. Thursday, Oct. 6, at Texas Hall. A question-and-answer session follows the lecture, as well as an autograph signing. VIP packages include a private dinner and photograph with the speakers. Preferred seating has front-of-the-line access to the book/autograph signing. The lecture is free for students, faculty, and staff and costs $5 for community members. LEARN MORE. 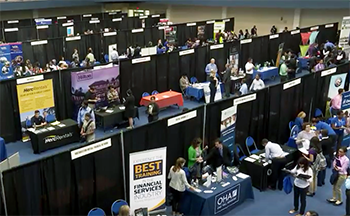 With 150 top companies from across North Texas in attendance, the All Majors Job Fair provided UTA students and alumni a perfect opportunity to network and connect. Watch the video. Register to vote on campus with help from Student Congress and the Center for African American Studies. Look for registration tables at various campus locations 10 a.m.-2 p.m. through Thursday, Oct. 6, and on Monday, Oct. 10. Also register 8 a.m.-2 p.m. through Tuesday, Oct. 11, in Suite 129 of the Swift Center. Visit the UTA Bookstore for your graduation needs during Grad Finale through Thursday, Oct. 6. Purchase your cap and gown, order your class ring and invitations, and have your photo taken in your cap and gown. Grad Finale is 10 a.m.-4 p.m. today, Tuesday, and 10 a.m.-7 p.m. Wednesday and Thursday. Get ready for another great year of our annual Bed Races on Wednesday, Oct. 12, at Maverick Stadium. Find your teams, find your costumes, and come out for our most talked about event of the semester. Register your team. 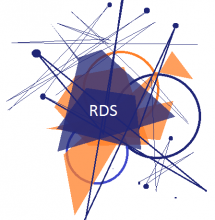 UTA Libraries present a new workshop series on data visualization, GIS, and statistical tools. Data Management is the first workshop at 2 p.m. Tuesday, Oct. 11; registration is required. Other workshops include Introduction to SPSS for Statistics, Cleaning and Preparing Data for Use, 3-D Analysis Using ArcGIS, Intro to SAS for Statistics, and Network Analysis Using ArcGIS. LEARN MORE. Friday, Oct. 7—Final deadline to apply for fall graduation. Through Monday, Oct. 17—Early and midterm Progress Report grades are available in your MyMav Student Center. Check your UTA email to see if you get PR grades.